3:45am. Quite an early start for the day. We departed for the train station from the hotel in tuk-tuks. A breezy start to say the least. With us bundled in with our bags it was… cozy. This would be our first experience of a day train, little did we know we would be on it all day! The train was old. Seats were broken. Tray tables loose and there was an unidentifiable liquid under and around our feet. Water I told myself knowing full well it was the opposite. The windows had a brown film on them, so it was nearly impossible to see outside. Not great for a day trip. The journey should of been about 8 hours from Varanasi to Lucknow. In the end it took nearly 13. The train randomly seemed to stop for long periods of time in the middle of nowhere, and for no apparent reason. We suspected it was waiting for other trains to pass on single sections of track. If this was the U.K there would be uproar, no announcements, massive delays. But this is Indian railways. Delays are expected. This train also included no food. So we relied on snacks bought before we got on- so by the time we arrived we were hungry. The doors were also left open the whole journey (including when moving at high pace) so you could hop on and off when it stopped to stretch your legs or if you felt like leaping off like James Bond or Indian Jones mid journey! 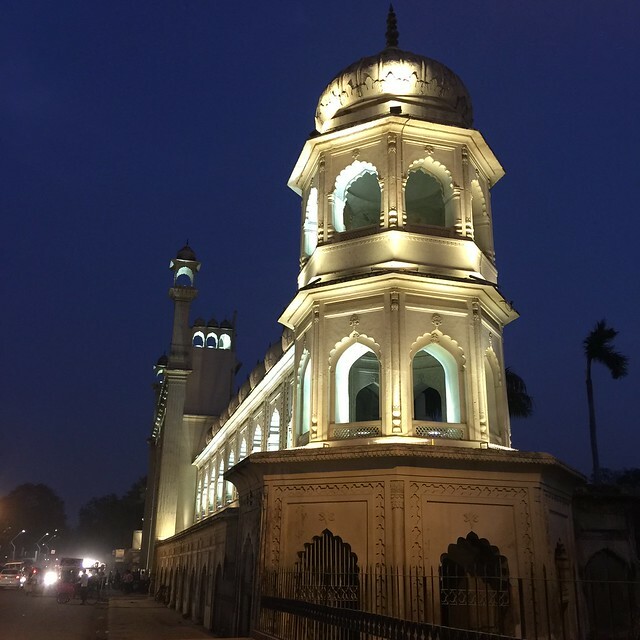 Once we finally arrived in Lucknow we were struck with the contrast to Varanasi. Much cleaner, organised and less cows (by less I mean there were still quite a few). We zipped in taxis and stopped for a quick bite to eat, which turned out to be not so quick as the waiters had appeared to never have taken an order before. Finally fed, we headed to the Bara Imambara. A stunningly beautiful collection of 230 year old buildings and mosques. 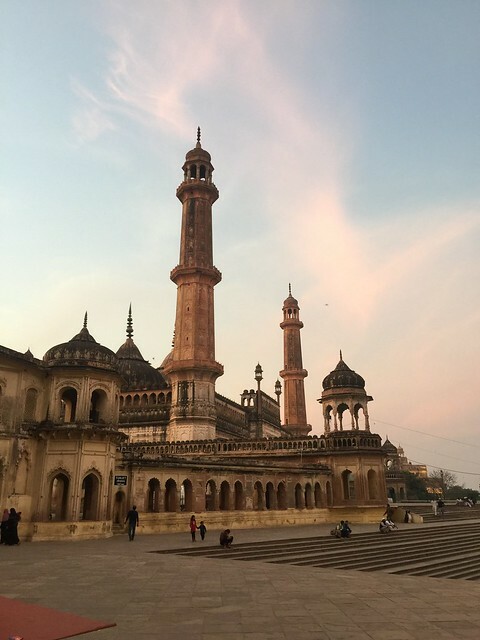 As it was sunset the light hitting the minarets and domes was spectacular. We had a guided tour and learnt about the history of the buildings. Interestingly, it contained the worlds longest vaulted ceiling with no supports or pillars. After the tour we had free time to snap to our hearts content. All our group agreed it was a top highlight of the tour so far. We stayed in the nicest and cleanest hotel by far, although it was quite a way from the town centre. Come morning we met in the lobby, and arranged guided taxi’s to take us to some of the city’s sights. These were delayed and caused us to have quite a rushed trip which was a shame as Lucknow has so much to offer. We visited the Residency. A 200 year old 33 acre site, where the British were sacked in the great uprising of 1857. The buildings now in ruins gave a spectacular setting and some beautiful photo opportunities. Due to limited time (having to hurry back for another train) we only had just under an hour here. We could of easily spent 2 or 3 exploring the site and visiting the museum. Make sure you leave plenty of time to see it if you are lucky enough to ever visit. We headed back to the hotel, got in an argument over the agreed price of the taxi’s (as the hotel had sorted them there was tax due on top which hasn’t happened all trip nor where we told about), and headed for the train station yet again, it hadn’t even been 24 hours since the last. 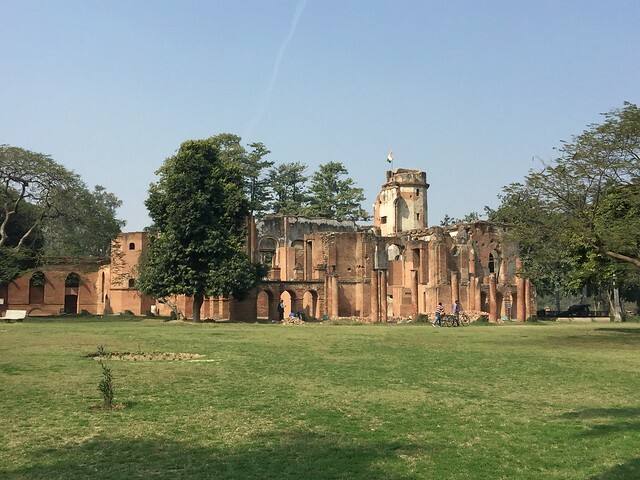 My advice would be to make sure you have at least 2 full days in Lucknow, as we could of easily spent longer at each historical site and have missed the other treasures that Lucknow has to offer. It was quite a whirl wind tour. Next stop Delhi, the end of leg one of our trip and the beginning of another.